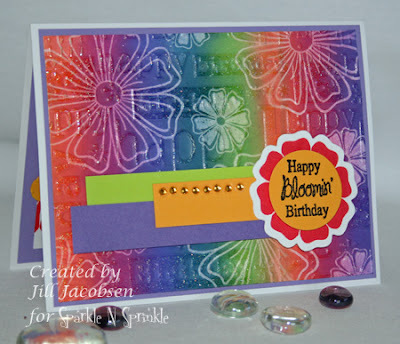 Here is another card created with the Blossoms set I designed. I started out with a Versamark Resist on White Glossy cardstock and the Kalidescope ink pad. Then the Try a New Technique last Monday at Splitcoast was to do double embossing - dry and heat....so I ran it through the Cuttlebug with the Birthday folder and then brayered Versamark on the raised areas and heat embossed it with Sparkle Embossing Powder. The sentiment is embossed with a Black Detail EP and placed on a cut out flower. Love how you did this card. Gorgeous colours. I've just finished a card with this set and am so pleased with how it turned out. Jill, what an eyecatchingly colorful card!